Film Review: ‘Touched with Fire’!! What is love? What would a person do for love? Touched with Fire explores a love, tested through a twisted, co-dependent fire because it was laced with manic-depressive disorder. The highs and lows of such an illness make even more unpredictable an emotion/action that is already completely varying. Take a ride with Carla Lucia (Katie Holmes) as her train collides with Marco “Luna” (Luke Kirby). Like mirror images, Carla appears to be the other side of Marco’s coin. Touched with Fire opens with a parallel comparison of the two. She scribbles swirls, he scribbles swirls, she paces in the wee hours of the night as does he, she is a poet and he is a rapper; a match made in limbo. What will love add to this crazy combo? Holmes delivers the panicky neurotic behavior of Carla. Her performance kind of reminded me of when she was the fear-drugged Rachel Dawes in Batman Begins. I still wished that she had come back in the sequel. I didn’t watch Holmes much on Dawson’s Creek, but I did enjoy her in Disturbing Behavior and Teaching Mrs. Tingle. Pre-Cruise, I really thought I’d see great things from Holmes. Now that she is post-Cruise, maybe this will happen. This is the first time I’m really seeing Kirby, but he certainly convinced me with his portrayal of Marco. I’m curious if he has any real life exposure to bipolar disorder. Paul Dalio, writer, director, and survivor, made Touched with Fire as an obvious journey for the viewers through the instability of these two minds. Speaking from his own personal struggle with bipolar disorder, his insight seems to be right on the nose. His stylistic choices are apparent yet inconsistent throughout the film. In the beginning, Dutch angles seemed to reflect the imbalance of the characters. The middle, while the lovers were together, the camera was level. Season titles were also used as situation identifiers. 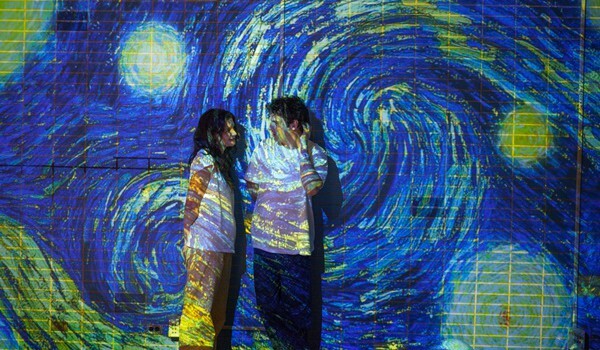 When Carla and Marco are enraptured in their mania, the walls of the hospital become Van Gogh’s Starry Night. This doesn’t transition well and for a moment the viewer might think it was real (not so difficult for people who couldn’t sleep) instead of a hallucination. However, when tragedy strikes, the camera doesn’t roll with it. Did Dalio get bored with keeping up the style? Did he realize how distracting from the story the style had become? This is my first exposure to Dalio’s work, but he is quite interesting. I look forward to seeing how he progresses. All in all, Touched with Fire puts you in the midst of a complicated experience of love. Dalio conveyed the effects of bipolar disorder on a romantic love relationship as well as the loved ones around them. As you might guess, bipolar disorder is not a joyride, but a crooked spiral. Watch with caution, because this trip will leave you drained. This film is particularly difficult to rate, because on one hand I can appreciate the insight shared, but the inconsistencies and dragging pace were also a bummer. This entry was posted on Wednesday, February 17th, 2016 at 8:38 am	and is filed under Film, News. You can follow any responses to this entry through the RSS 2.0 feed. You can skip to the end and leave a response. Pinging is currently not allowed. « We’ve Got The Awesome Trailer For ‘Alice Through The Looking Glass’!!! Why do I get the feeling that we've picked up another pathetic life form?